Here you will give you some fun things that can be experienced at or near Bayshore Cottage! Golfing There are four courses within a half hour drive of the cottage! Every Friday afternoon, Purvis Brothers have a truck in Mindemoya (parking lot next to grocery store) selling fresh whitefish, trout and smoked fish. Cold Water Fishery that sells a wide variety of local and east coast fish, scallops, lobster in Little Current (behind Beer Store). The grocery stores in both Little Current and Mindemoya always have trout and whitefish (we prefer the whitefish). Dan who rented in 2007 took $200 in vacuum packed rainbow trout home (from Cold Water Fishery in Little Current). There is a riding stable 3 K from the cottage near Silver Birches lodge. There are also other stables available. Native Culture - There are many native art galleries in M'Chigeeng and Wikwemikong that feature local artists. The Objibway Cultural Centre in M'Chigeeng is worth a stop. There is theatre in Wikwemikong that is also quite nice. Edwards Art Gallery in Kagawong is quite nice. Perivale Art Gallery at 1320 Perivale Rd, Spring Bay (on Lake Kagawong is harder to find but a nice little gallery. Ten Mile Point and Trading Post - not only one of the best viewing points (ten miles from Little Current on Highway 6) it has a gift shop with outstanding native art, crafts and much more.. Well worth the trip to visit. There are excellent local museums that feature early life on Manitoulin in Manitowaning and Sheguiandah that are worth a visit. Suggest packing a lunch, and head towards Kagawong where you can view the famous Bridal Veil Falls, for a walk along the river and hike back up the road. While there, check out Edwards Gallery, the Chocolait Factory or the African store or the old fashion candy story. Head over to Providence Bay for a nice beach experience. Drive to Little Current and a walk along the dock with views of the swing bridge and look for Farqhuar's hand dipped ice cream. Then take highway 6 to Sheguiandah and visit the Howland Museum. After that, move along highway 6 with a stop at "Ten Mile Point for a fantastic view of the channel and a visit to the gift shop. Keep going to Manitowaning to visit their museum for a true taste of frontier life on Manitoulin Island. After visiting the museum, head back towards Little Current again and backtrack along Bidwell Road (see directions to cottage) for a pleasant view of the country. There are plenty of side trips and places to explore. Visitor Centres can provide detailed advice for you of places to see. 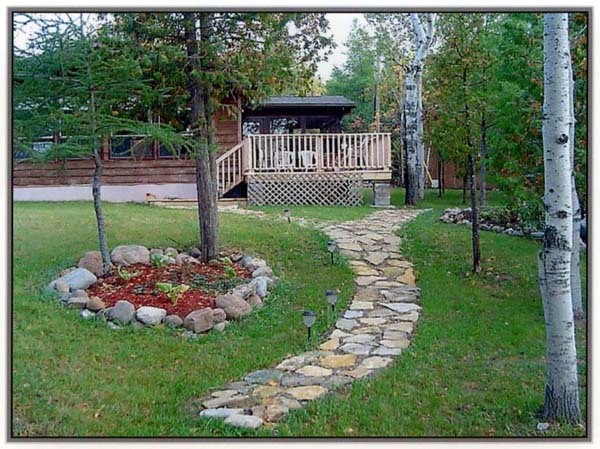 There is no dock at the cottage (too rough to keep a dock in) but there are boat launches in Little Current, Rockville, and M'Chigeeng to fish for lake trout, salmon, rainbow trout, Nipigon Speckled Trout, pike perch, walleye or bass. You can also rent boats at local lodges. Foodland Grocery Store - Mindemoya is a new and excellent grocery store, carries fresh fish, has a liquor and beer and a full pharmacy. GG's and Food Mart - Little Current carries good line of groceries. Bakery - Mums Bakery and Restaurant - Mindemoya is a "Gem" that has excellent baking. DO NOT MISS THIS ONE! Ice Cream - NO visit to Manitoulin is complete without hand dipped Farquhars Ice Cream. Try it and be your own judge. Better still, what about a glass of wine, a good book, nice fire in the fire pit or simply curl up in the sun room with a coffee and good book (or not) and listen to the waves and tree leaves? If it is cold enough, there is always the wood stove. As one guest stated "What a place, I even took my teeth out!"